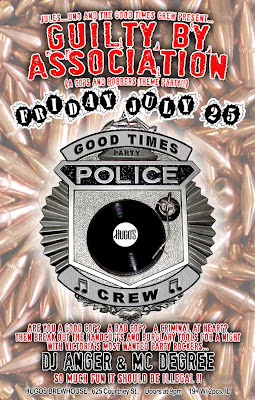 Jules_Uno and Victoria's most infamous party rockers the Good Times Crew are hosting a "Cops and Robbers" theme party!!!! Are you a Good Cop? A Bad Cop? A Criminal at heart? Then break out the handcuffs and burglary tools and join a cast of Thieves, Crooks, Jailbirds,Constables, Sergeants and Patrolmen for a night so fun it should be illegal! There will be Great Drink Specials so you can get a steal of a deal on your thirst quenchers as you rock the night away with Victoria's Most Wanted Party Rockers, DJ Anger and MC Degree One. We'll have the place all decorated in a cops and robbers theme and there will be great prizes for the best dressed Authority Figure and Hardened Criminal so dress up and follow the law of 'Good Times' !!!!!!! !